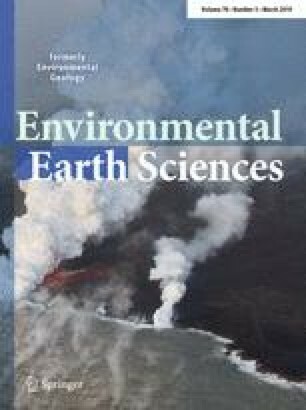 The research on tailings deposits regarding geomorphic approaches, aeolian activity and integrated physical–chemical dynamics and instability is almost inexistent. This work performs such analysis at the San Quintín Mine site, located on the Alcudia Valley region of central-south Spain. The first evidence of mining activity on San Quintín goes back to 1559 and the last one to 1988. The mine activity here produced two very different deposits. ‘Old tailings’ correspond to early concentration procedures between 1889 and 1923. The resulting piles look chaotic and the tailings vertically and laterally alternate with rock wastes. These deposits have been eroded, mostly, by fluvial processes. ‘Modern tailings’ deposits correspond to more efficient froth flotation treatments, between 1973 and 1988, when part of the old tailings were reprocessed. The grain size of these latter tailings is more homogenous, mostly sandy, which favour intense aeolian erosion. By means of a detailed inventory, we were able to identify and catalogue both fluvial and aeolian landforms, along with those produced by weathering or mass movement. We also quantified aeolian erosion, obtaining a single net wind transport rate of 12.6 t ha−1 year−1, related to WSW winds. From an understanding of the geomorphic activity of the mined area, we propose guidelines for the restoration and remediation of the site, comprising wind erosion prevention measures for the modern tailings and physical stabilization through geomorphic restoration for the old tailings, combined with chemical remediation measures that have been proved useful on similar cases: open limestone channels connected to constructed wetlands. This study has been funded by: (1) Project CGL2015-67644-R (Spanish Ministry of Economy and Competitiveness) (2) The Ecological Restoration Network REMEDINAL-3 of the Madrid Community (S2013/MAE-2719).